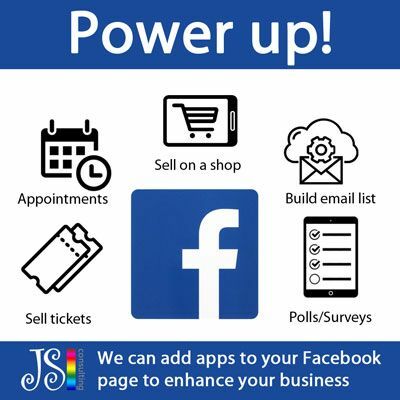 Whether you're planning a Facebook page as your first 'toe in the water' online or as an extra dimension to your existing website, JS Consulting offers help to you get up and running. We take care of the detail, make sure your page looks thoroughly professional and is set up to help your business succeed. We can also help with installing extra apps to increase the functionality of your page and fully integrate Facebook with your website from a search engine perspective. Facebook Business Pages aren't difiicult to establish. But when it's all new to you, the choices are bewildering. We can set up the relevant template for your business, add all your company information and write original copy to present your business effectively. JS Consulting can be your helper and guide to get your business going on Facebook. Standard cover backgrounds are OK, but you'll know and appreciate when a business has taken just a little extra effort with their presentation. A good cover picture sets you apart from the rest! We work with Photoshop, understand about getting dimensions right and set you on the path to success. Includes a full range of elements to build a powerful online presence for your business. Facebook apps offer a wide range of extra functions that aren't included in the standard page - especially the kind that make it easier for people to do business with you. Through discussion with you, we'll be able to recommend solutions to help you achieve your business goals. What does Power Up cost? Facebook Apps are made to be easy to install - taking anything from minutes to hours to install . Some depend on accounts already being set up (which we can also do for you) and others carry a small cost or subscription. So the bottom line is we charge £40 per hour plus any associated app charges - rather than define a unit charge. Yes you could - Facebook is designed to make things easy for people to use themselves. Our Facebook set up service is designed for people who don't have too much time - or who lack confidence to see it through on their own.